Philodendrons are among the most popular, tolerant, and durable of all house plants. There are many different species of Philodendrons, each possessing it's own characteristics as to leaf size, shape or coloring. Some species climb while others remain in more of a shrub shape. Most Philodendrons are native to the jungles of tropical America, and as such, prefer the medium light intensity they would have on the jungle floor. They will tolerate low light, but if there is too little light, the new leaves will develop smaller, and farther apart on the stem. On the other hand, direct sunlight will burn the foliage, and stunt the growth of the plant. Keep the soil evenly moist, but allow it to dry out between waterings. Keep Philodendrons slightly drier during the winter months, when the growth slows. 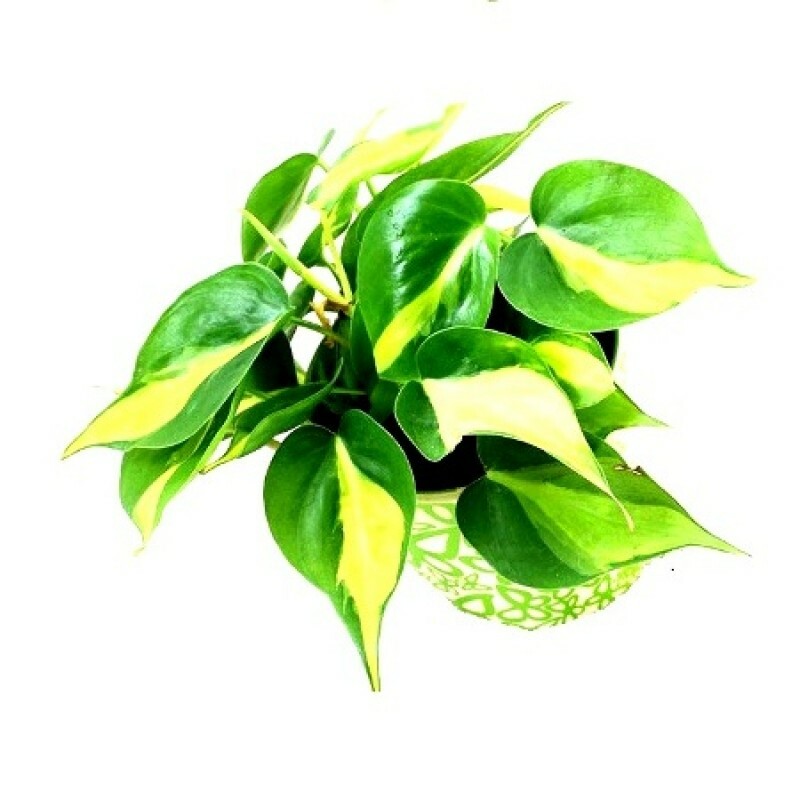 Over watering will cause the leaves to turn yellow. Under watering will cause the leaves to turn brown and fall off. Feed your Philodendron in the spring and again in mid summer with a liquid house plant fertilizer. The ideal growing temperature is between 75 and 85 degrees F. during the day and in the 60's at night. Philodendron Plants will survive for a short time in temperatures as low as 36 degrees F. Wash the leaves regularly to prevent the pores from becoming plugged with dust. Philodendrons will tolerate the level of humidity found in most homes, but high humidity promotes lush growth and shiny foliage, so it is a good idea to mist the plant regularly. Philodendrons grow best when their roots are slightly cramped, (but not too cramped), so don't plant them in a pot that is too large. When the roots begin to compact into a tight ball, the plant should be repotted into a planter that is 2-3 inches larger. Repotting should be done in late winter or spring, before the plant begins active new growth. Good drainage is essential, so if there are no drainage holes, be sure to fill the bottom of the pot with clean stones or broken crockery. Use a good commercial potting soil or a mixture consisting of equal parts of loam, sand and peat moss, with some chopped charcoal, gravel, broken crocks or brick added. Newly potted plants need to be carefully watered during the first month or so, to be certain that the roots don't dry out completely. Never allow the soil to become saturated or soggy. It's especially helpful to mist the leaves of newly planted Philodendrons two or three times a day. It is also a good idea to add a moss stake or other type of pole to the planter at the time of repotting if this is a climbing or vining type of Philodendron. As the plant grows, it will need some sort of support. The are several types of plant poles available at garden centers. Some types of Philodendrons produce aerial roots which will cling to whatever support they find. These roots should never be cut off completely, but they can be trimmed back if they become too long, or begin to die back. It is far better to attach these roots to the support pole, or lead them back to the pot where they can grow into the soil.